오설록은 오설록 티하우스가 속한 지역 특색에 맞는 방식으로 차가 가진 ‘시간, 쉼, 여유’를 전하고자 합니다. 오설록 티하우스 대학로점은 혜화역과 대학교가 인접하고 사람들이 많이 찾는 각종 공연장 주변에 위치해있습니다. 대학로가 가진 젊고 자유로운 분위기에 맞춰 기존의 차분한 이미지를 덜어내고 ‘감성’(Sensibility)과 ‘여유’(Laid-back)의 Keyword 를 더해 더 친근하고 감각적인 오설록으로 재정비 되었습니다. 매장 간판에 감각적으로 배치된 녹색라인은 제주의 돌을 닮은 회색 외관에 활기를 주고 어두운 밤에는 조명으로 발현되어 낮과 대비되는 밤의 풍경을 만들어냅니다. 또한 매장 내부에 수수께끼처럼 매장 곳곳에 적힌 녹차와 제주도에 관한 글귀는 호기심과 생동감을 더하고 있습니다. 녹차가 그러하듯, 제주가 그러하듯 오설록 티하우스는 바쁜 도시를 사는 사람들에게 청량한 쉼의 순간을 제공하고자 합니다. Osulloc seeks to deliver "time, rest, and laid-back" to those who visit while reflecting the region's colors and characteristics. 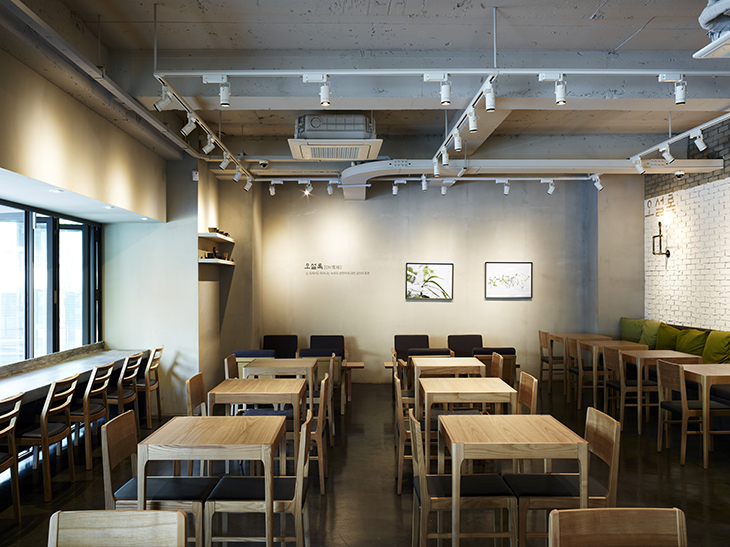 Osulloc Tea House in Daehakro is located in an area packed with theaters near a university and Hyehwa Station. 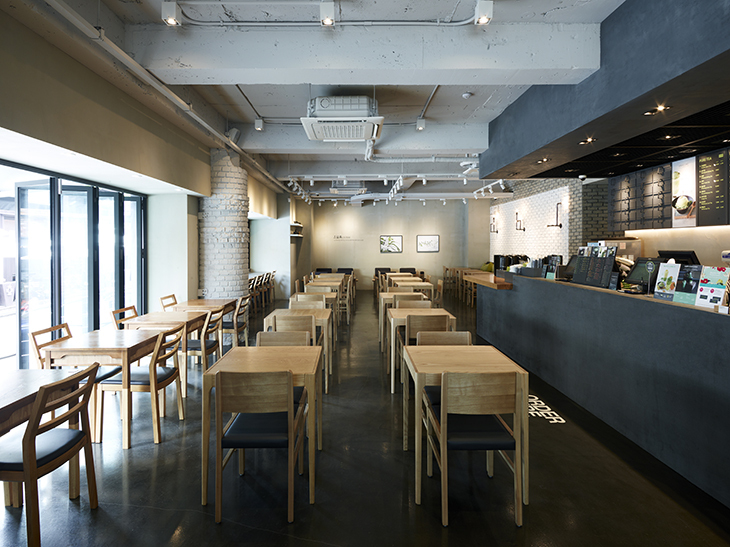 Using "sensibility" and "laid-back" as keywords, the design is much livelier than Osulloc's quiet, poised atmosphere. The Daehakro venue is much more approachable and friendlier. The green stripes on the sign emphasize the grey that resembles the volcanic stones on Jeju Island and lights up at night. 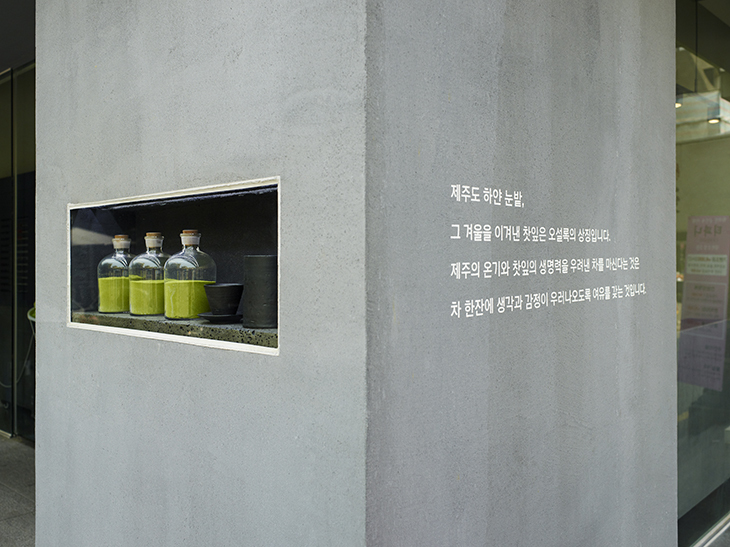 There are explanations on the wall to help the patrons understand green tea and Jeju Island. Just like green tea and Jeju Island, Osulloc is a peaceful oasis for busy city residents, a place where people can recharge themselves.